When the Yeates’ contacted me to be their Seattle maternity photographer, they mentioned they were a military family! It’s such an honor for me to photograph military families! My husband is medically retired from the Army, so I have a special appreciation for those who serve our country. I also offer a military discount to my families because I think that it is well-deserved. 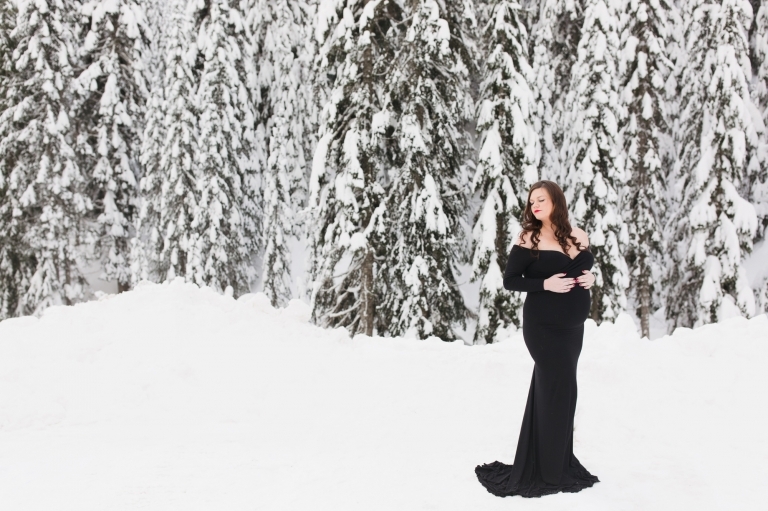 When discussing locations for their snow maternity session, it was a no-brainer on where to go! Alpental – Summit at Snoqualmie is one of my favorite spots for snow sessions! There’s beauty everywhere you look up in this area! The best thing about it is that the location is only an hour away from the city, so it makes for a nice, quick trip up to the mountains! I chose this particular area because the snow sits so beautifully on the trees and the scenery is so serene! The location I chose was actually a parking lot, but you would never know in these photos! My vision came to life and I am so happy with this winter wonderland of a session! The best part of the session is that mom wore the most gorgeous dress for her maternity photos! The black blended in with the tree line perfectly and her figure is amazing! She was absolutely stunning and I couldn’t have asked for a better couple to work with! They were such troopers too! It was a whole 15 degrees during their maternity session! It was so cold that halfway into the session, we jumped into our cars to get warm! I was very honored to be their Seattle maternity photographer and I’m looking forward to their newborn session next week! Christina Mae Photography is a Seattle newborn photographer located in Western Washington. Tina is a newborn, baby, maternity, family and child photographer serving Tacoma, Puyallup, Seattle and the surrounding communities.